After countless raves about the greatness of Micheal Angelo's Pizzeria from friends, Meg and Tom, it was evident that I was clearly missing out on something spectacular. Both friends are usually spot on when it comes to good food, that I was somewhat disappointed in myself that I still hadn't tried it. Well they finally fixed that and I thank them profusely. As you can see from the above picture, we ordered Michael Angelo's Sophia Loren thin-crust pizza this weekend, and let me tell you, it didn't stay in the box for long. Next time we'll have to account for seconds (and thirds). 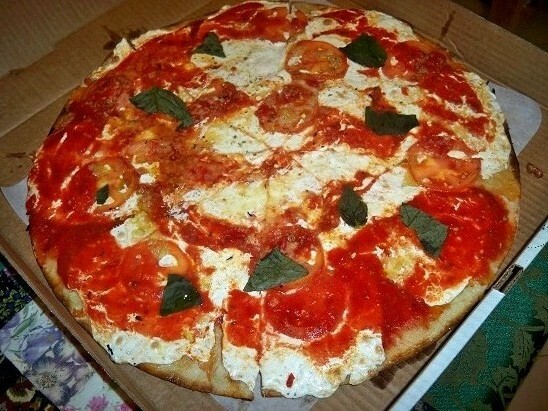 Sophia Loren Thin-Crust Pizza - A very classic, sophisticated yet simple pizza pie, not unlike Sophia Loren herself, this pizza was topped with only the best quality ingredients such as fresh mozzarella, tears of fresh basil, tomato sauce and thin tomato slices too. The thin-crust dough was perfectly crispy near the crust, but soft enough to bend in the middle. Each bite was perfect and felt super light - I didn't get a weighed down feeling I sometimes get when I indulge in store-bought pizza. The spices were just spot on, not too strong but still packed with flavor. I think this is a great option for traditionalists and pizza connoisseurs alike. All these amazing ingredients come at a premium, as their small Sophia Loren will set you back $10.75, while the large one is a whopping $19.50. So worth it though! this was my last meal in astoria - before i moved back to the midwest. i still have dreams about this pizza. seriously, my all time favorite. They have a thin crust pizza with 3 or 4 cheeses and wild mushrooms. It's unbelievable! Rich and delicious. Must be eaten within 15 min of coming out of the oven. Never had anything like it anywhere. I don't know the name of it.